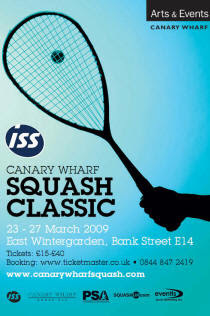 The London sojourn for the men's tour reaches a climax this week with the Canary Wharf Classic (23-27 March). Now in its 6th year, the docklands event is loved by players and spectators alike for its infectious atmosphere and East Wintergarden location. Following the launch of '21st Century Squash' at last week's Super Series Finals (report to follow very soon! ), what can we expect from the Eventis team ...? Like the Super Series event last week at Queen's Club, Canary Wharf is being pitched as an Olympic showcase before October's vote for which sports should be included in the 2016 Games. The Super Series was filmed for promotional reasons: let's hope Canary Wharf receives the same treatment. The Super Series was seen by many in the squash community as a 're-launch' of the men's tour as a product. It will be interesting to compare these well-ran events - always held very close to each other - to try and establish what should be the new benchmark standards for putting on professional squash tournaments. As part of the event, schoolchildren from Mayflower Primary School have been invited to the Tuesday session after attending a training session with Peter Nicol (see the link for an encouraging comment from London Mayor Boris Johnson). James Willstop will be looking to put down an early market in the tournament in an event that he has almost made his own (he has won it three times). He faces Alister Walker in the first round, who scored the best win of his career here last year, beating Gaultier at the same stage. The recent form of Nick Matthew (not at Queen's) means that he will be fresh to challenge top seed Amr Shabana. The former World Champion has never won a major tournament here.